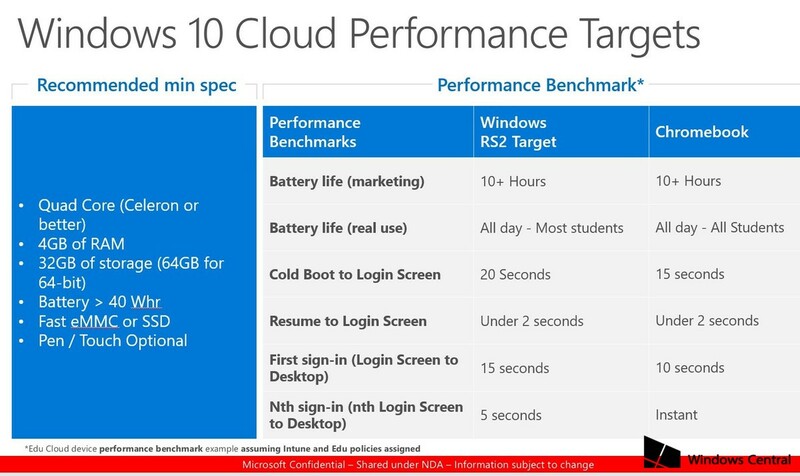 Windows Central has gotten its hands on an internal document highlighting the hardware performance of Windows 10 Cloud, a rumored operating system spinoff expected to be unveiled at next month’s big education event in New York. Predictably, the slide puts the OS head to head with Google Chromebooks. The category is a no-brainer for Microsoft as the company struggles to gain a foothold in the K-12 education space that has been utterly dominated by Google’s cloud-based offering. Microsoft saw something of a spike in the category in the late-00s, courtesy of the short but vibrant netbook boom, which helped educators realize the long hoped for promise of one-on-one devices for students, but that began to shift as tablets entered the scene. In recent years, however, Chromebooks have utterly dominated the conversation, through a combination of cheap hardware and control by the IT departments that make many of the purchasing decisions for schools and districts. Microsoft’s main education play of late has been on the Surface side, though iPads have seemingly done a better job capturing the market for schools that don’t mind paying an extra premium for devices. The company was rumored to be launching a Surface Phone or new Surface Pro at the event, but we were able to confirm otherwise. Microsoft’s certainly hinted at its aim to return to low cost education offerings. In January, the company discussed Intune for Education, which brings cloud-based management to a $189 Windows 10 aimed at schools. The event being held on May 2 will almost certainly detail devices it thinks will be able to go head to head with Chromebooks on things like battery life, cost and wide scale device management. While the company hasn’t had much luck on the education from of late, there may still be demand for a reentry, given Microsoft’s still popular productivity options. Google’s made a lot of progress with its Cloud-based G Suite, but there’s still cachet among professional when it comes to offerings like Office. There’s also something to be said for a system that offers a version of a near ubiquitous ecosystem like Windows. But even with those factors at play, Microsoft is going to have to offer up a lot more than just a Windows version of the Chromebook if it hopes to make a dent in education.